August 11th, 2013 | Faces of Wheaton. This week’s Sunday Sit-down features the interesting hobby and passion of an agent who works for our partner company, Bekins Van Lines. Bekins has been a partner company to Wheaton World Wide Moving since February of 2012. Talk about someone who truly bleeds Bekins. 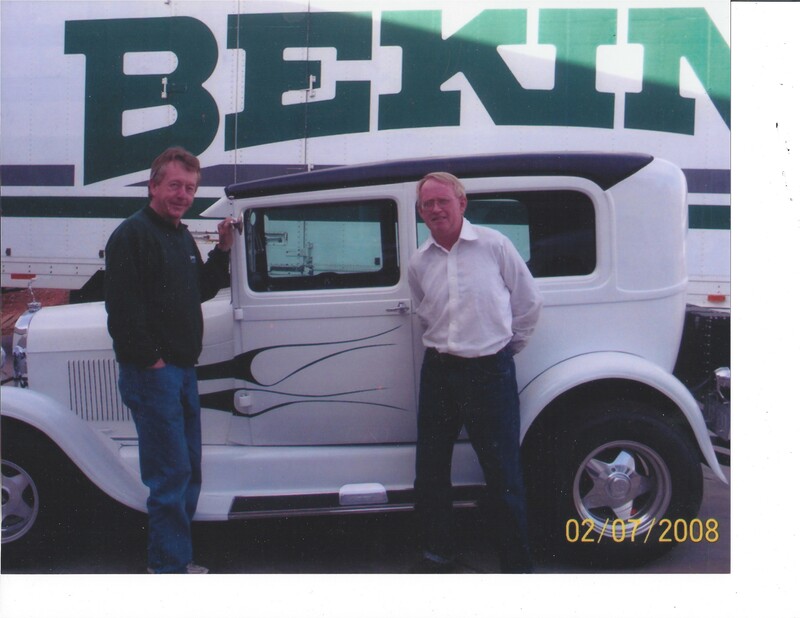 Ralph Bingham has worked with Bekins Van Lines in some way since he was 24 years old. He recently celebrated 36 years with the company at the beginning of August. Bekins hasn’t just infiltrated his professional life though. 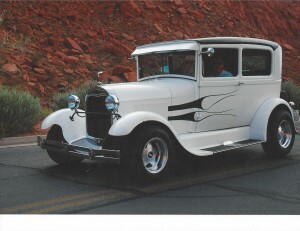 Look inside Bingham’s garage and you will see something a bit unusual: a refurbished 1929 Ford Model A Tudor with the outside of the car painted in Bekins’ signature colors of green and white. 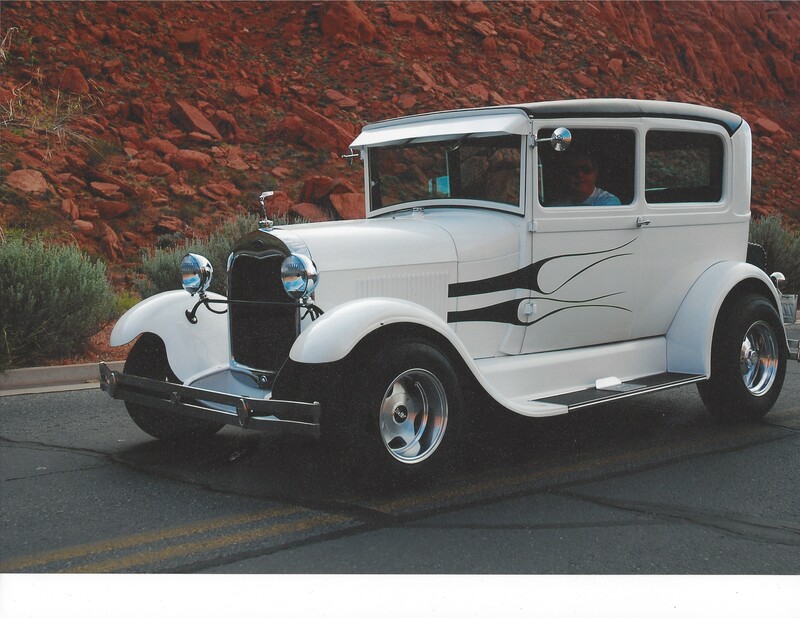 Talking to Bingham, it’s evident that he’s proud of not only about his career with Bekins, but also of his hobby of restoring old cars, especially this Ford. “I’ve had several cars over the years, but none quite like this Ford. This was the first car I bought and worked on and it means the most to me.” Refurbishing the car to its current pristine condition was no easy task though. At the age of 16, Bingham found the shell of his car at a local junkyard in his hometown. The car lacked seats, tires, and even an engine, but he was able to look past the flaws and envision what the car had the capability to be. He spent nearly four decades and almost $30,000 buying parts and laboring over the car, but to him, this car is priceless. “This car is in the same category as my daughter and my wife– not for sale!”, Bingham says with a laugh. Bingham doesn’t hesitate to say that his favorite part of owning this car is when he takes it for a drive up and down the freeway. “I get lots of thumbs up and high fives. I have a lot of people out there who think we’re friends because I’ve got a cool car.” For a car lover like himself, this automobile is truly his pride and joy. There’s no better form of employee loyalty than when someone will not only work at a company his whole life, but also deck out his personal belongings to replicate the brand image of their employer. For Bingham though, there was never any question as to whom or what he would dedicate this automobile to. “I’ve always had a mental picture of this car being a representation of my career. I’ve never worked for anyone other than Bekins, so it was pretty automatic.” No matter where Bingham and his Ford go, they are constantly promoting not only Bekins Van Lines, but also his storied career and love for the company as well. Ralph Bingham has always been an agent-owner and a driver while working for Bekins. Never a fan of office work, he always hired other people to manage the day-to-day operations of the business while he maintained the position of a driver. He spent and still spends his days delivering loads and shipments, interacting with the customers, and cementing himself as the face of his agency, Dixie Moving & Storage. A self-declared people person, Bingham loves that every day is different and that he’ll spend his days talking and communicating with the people his agency serves. 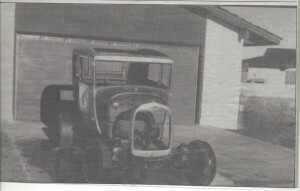 It’s a sure fact that he tells his customers about his Bekins-inspired Ford Model A, too. Ralph Bingham isn’t Wheaton’s only talented employee.